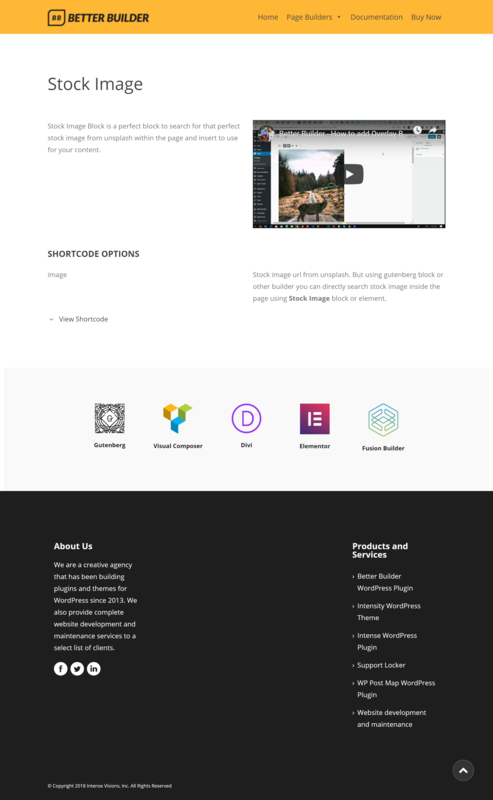 Better Builder is compatible with Gutenberg, WPBakery Page Builder (formerly Visual Composer), Fusion Builder, Divi Builder, and Elementor Builder. Animated Sprite – The animated sprite block adds animated images that slide left, right, up, or down along the screen. You can also control the speed and position of the image. Multiple images can be added together to create impressive effects. Audio – The audio block adds an audio player to your pages and posts. Easily let your users play music or any audio file right on your site. Box – The box block adds an easily styled section. 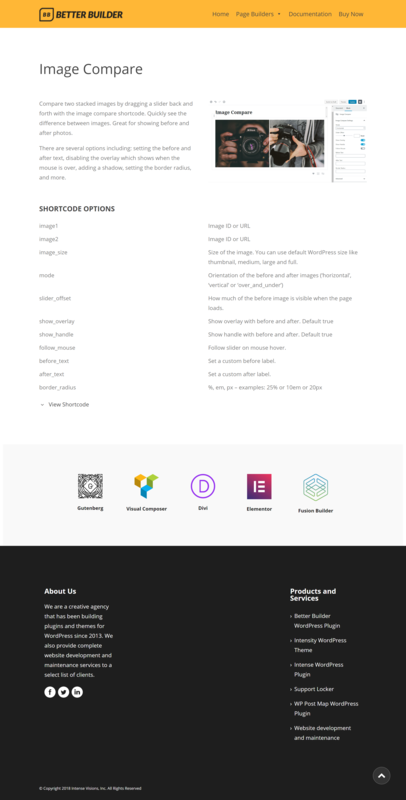 It is one of the most useful and powerful shortcodes for designing WordPress posts and pages. 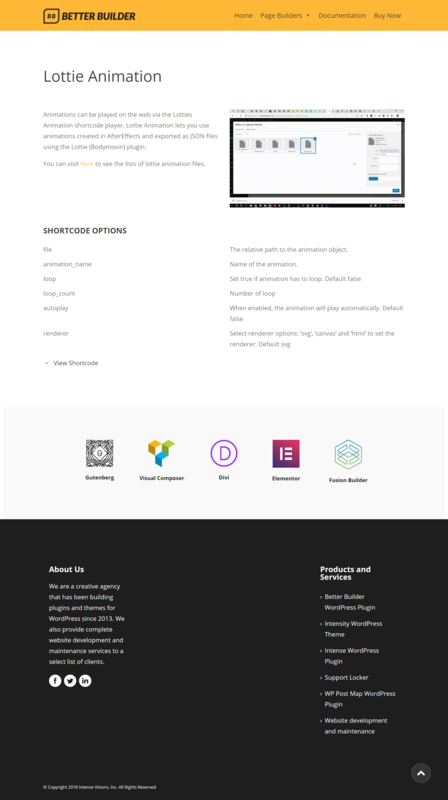 Button – The button shortcode adds a clickable button to your WordPress website. Buttons can be used to redirect the user to another part of your site or to another site completely. Filler – The filler shortcode helps you quickly mock up content by adding filler text and images. When designing a page or post, it is helpful to drop in text and images so that you can get the idea of how things will lay out. Gif Player – The gif player block adds an gif player to your pages and posts. The Gif Player enables you to animate on mouse hover / mouse click / touch event. Icon – The icon block quickly adds an icon to your pages and posts. Easily find the icon you are looking for using the shortcode dialogs. Image 3D – The image 3d block quickly adds an Image 3D Effect to your pages and posts. Create a 3D interactive object using Image 3D Block. Image Compare – The image compare block compare two stacked images by dragging a slider back and forth with the image compare shortcode. Quickly see the difference between images. Great for showing before and after photos. Image Zoom – The image zoom block adds an Image Zoom Effect when you click an image to your pages and posts. 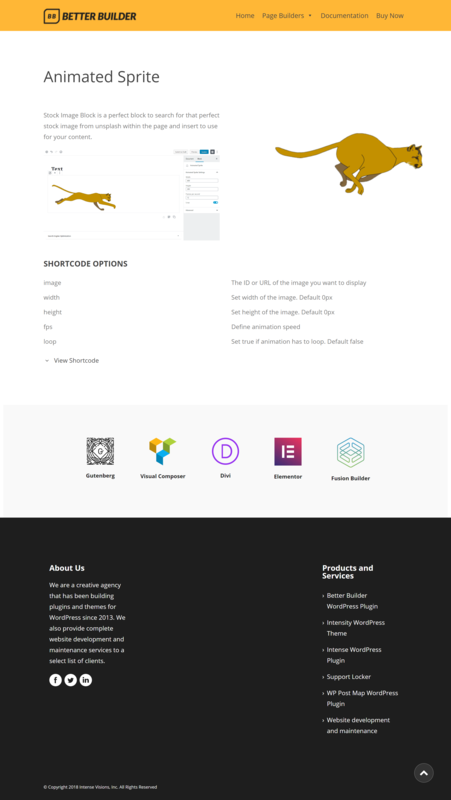 Image zoom creating a responsive, user-friendly image zoom / lightbox effect on your pages. Lottie Animation – The Lottie Animation block render AFTER EFFECTS animations natively on Web. Animations can be played on the web via the Lotties Animation shortcode player. Overlay – The overlay shortcode is used to add an overlay that will show when the user hovers over the image. You can add your own content to show as part of the overlay. Panorama Viewer – The panorama block adds an panorama image to your pages and posts. Panorama Viewer will let you display wide and tall images in a more accessible way. QR Code – Add QR codes (Quick Response Code) to WordPress using the QR code shortcode. Spacer – The spacer block add a spacer of a specified height in your WordPress pages and posts. The spacer shortcode can be used to fix floated elements (ie. clear left, right, both). 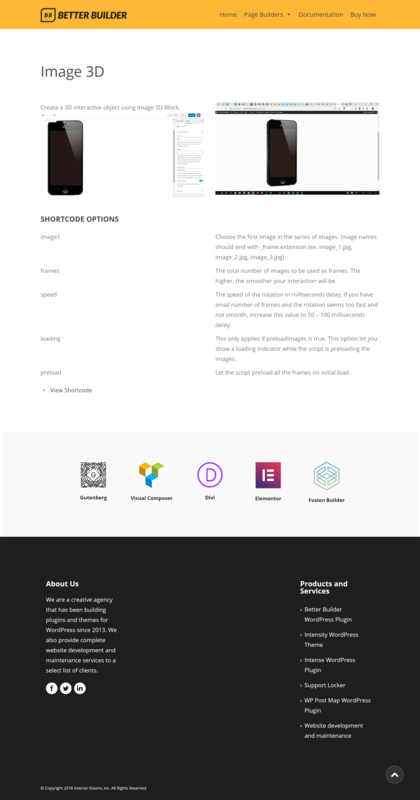 Stock Image – Stock Image Block is a perfect block to search for that perfect stock image from unsplash within the page and insert to use for your content. Template – Use the template shortcode to add the content of a file template to the post or page. The file template, along with the template shortode, are a perfect way to add dynamic content. They are also a powerful way to reuse content across your WordPress website. Text – The Text block allows you to go beyond your theme’s defined text layout. The text block is a powerful tool that is great for special text that compliments the design of a specific area of your site. Tilt – The tilt block causes the image to move around as you hover over it with your mouse. You can make a visually pleasurable, interactive image effects. Typewriter – The typewriter block adds a typing text to your WordPress website. Enter in any string, and watch it type at the speed you’ve set, backspace what it’s typed, and begin a new sentence for however many strings you’ve set. Set strings each line to set multiple strings. Better Builder is compatible with older versions of WordPress, although the Gutenberg blocks will only be available when using those versions of WordPress that include Gutenberg (5.0 and newer). If you have any questions, please let us know.